Bryan and Jennifer Caswell at Oxbow 7, the restaurant they founded in October 2017. Photo by Phaedra Cook. As first reported by Alison Cook of the Houston Chronicle, chef Bryan Caswell and wife Jennifer have been “released from their contract” to operate Oxbow 7, the restaurant they opened this past October. It’s on the first floor of the Le Méridien Houston hotel at 1121 Walker. A representative for the restaurant says Oxbow 7’s chef de cuisine Michael Hoffman, previously of Mark’s American Cuisine, is currently the acting executive chef. 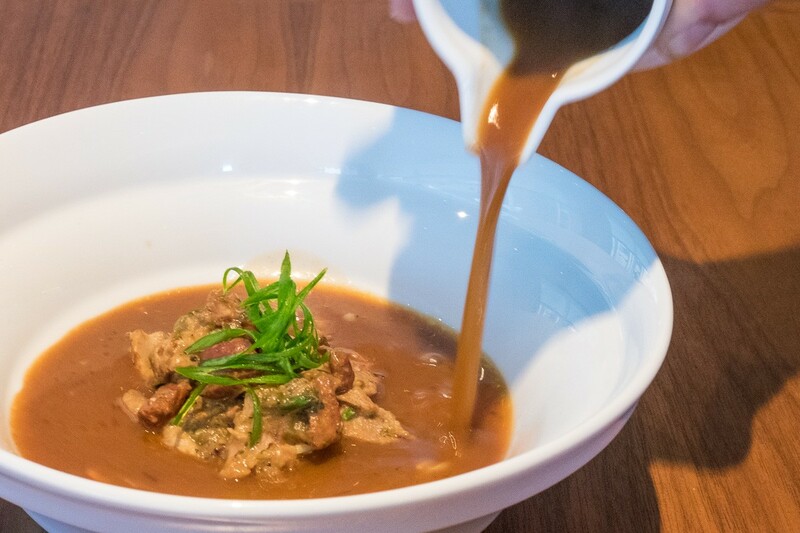 Duck and andouille gumbo with the roux-based stock poured tableside at Oxbow 7. Photo by Phaedra Cook. After Hurricane Harvey flooded Houston, the couple was an instrumental part of relief efforts as one of the teams that established a rescue kitchen. They set up a base of operations at Reef once flood waters receded there, sending out thousands of meals to evacuees and first responders with the help of dozens of volunteers. After that, they traveled from Houston to help in Rockport, Texas, where Hurricane Harvey made landfall.